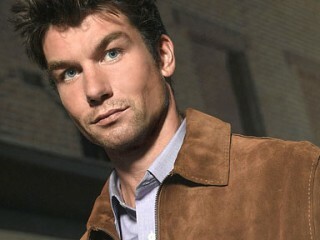 Jerry O'Connell is an Irish-American actor, best known for his roles in the TV series Sliders, Andrew Clements in My Secret Identity, Vern Tessio in the film Stand by Me, Charlie Carbone in Kangaroo Jack, and Detective Woody Hoyt on the drama Crossing Jordan. He starred as Pete Kaczmarek in the CBS TV series The Defenders until its cancellation in 2011. O'Connell was born in New York City, the son of Linda (née Witkowski), a Polish art teacher, and Michael O'Connell, an advertising agency art director. His maternal grandfather, Charles S. Witkowski, was the mayor of Jersey City, New Jersey. O'Connell is of Irish descent on his father's side and Polish ancestry on his mother's. O'Connell was raised in Manhattan with his younger brother, Charlie O'Connell, also an actor. O'Connell began his acting career at a young age. As a child, he did commercial work for Duncan Hines cookies. Shortly after at the age of eleven, he landed his first feature film role as the character Vern Tessio in Rob Reiner's Stand by Me. As a teenager, he starred in the Canadian TV series My Secret Identity from 1988-91, and attended Manhattan's Professional Children's School. O'Connell attended New York University (NYU) from 1991 to 1994, majoring in film. While there, he studied screen writing and competed on the NYU fencing team, serving a stint as captain of the sabre squad. He began his acting career at a very young age. He did commercial work and TV work before getting the role of "Vern Tessio" in the popular film Stand by Me (1986) opposite River Phoenix and Corey Feldman. After that, he worked on several TV-Movies and TV-series and had a starring role in "My Secret Identity" (1988). From 1991 to 1994, Jerry attended New York University where he majored in film, but he didn't graduate. In 1993, he starred in the film Calendar Girl (1993) opposite Jason Priestley. In 1995, he starred in the TV-movie western The Ranger, the Cook and a Hole in the Sky (1995) (TV) and, in 1996, he landed the role of "Frank Cushman" in the successful film Jerry Maguire (1996) opposite Tom Cruise. Over the next few years, he starred in Scream 2 (1997), had a small uncredited role in Can't Hardly Wait (1998), as well as appearing in several TV-movies and having starring roles in the TV-series "Sliders" (1995) and the film Body Shots (1999) opposite Sean Patrick Flanery and Tara Reid. In 2000, he appeared in the Brian De Palma film Mission to Mars (2000) with Gary Sinise, among others. He has also appeared in movies such as Tomcats (2001), Buying the Cow (2002), Kangaroo Jack (2003), Yours, Mine and Ours (2005), Man About Town (2006) and Room 6 (2006). In 2007, he married actress/model Rebecca Romijn and they are expecting twins in the winter of 2008. Sliders (1997) TV series  "Stoker"
Sliders (1999) TV series  "Slidecage", "Lipschitz Live," "Data World", "Roads Taken"
View the full website biography of Jerry O'Connell.